With the onset of warmer temperatures, a new crop of wardrobe challenges present themselves, especially when dressing for work. While it would be pretty sweet to jet off to the shore and wear next to nothing all summer long (props to those who do! ), many of us still have to show up and look sharp. But what to wear when it's too hot to layer and you'd rather be in the ocean than at the office? This month, I'm sharing lightweight, fashion-forward options you can wear to work to keep you feeling styling and summery no matter what your line of work. Lucky for our legs, this breezy, slightly relaxed (a'la European vacation) silhouette is back this summer. Wid legged pants are an excellent option for work because you still have the structure of a high waist, but none of the constriction slimmer trousers or pencil skirts can bring. Select unlined, lightweight cottons, linens (but beware of wrinkles), or silks. Make sure the waistband hits at your natural waist so you can tuck in your top and add heels or wedges to lengthen those limbs. 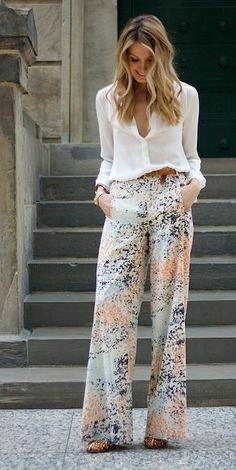 Those of you in less conservative work environments can be a little more adventurous and try bolder printed or cropped culotte versions. We've all seen full skirts make a comeback this year, and the feminine, curve-flattering shape is comfortable and roomy. For summer, however, the extra-full versions feel to structured. During the warmer months, go for a less voluminous version or a knife-pleated skirt in unstructured, breezy fabrics like silk or chiffon. You can belt the waist and tuck in a shirt of the opposite texture (think oxford cotton with silk or denim and chiffon) to create a modern work-appropriate outfit. Trendy gals, look for a gingham or buffalo plaid versions in tea-length and wear something bright on top. If you're not feeling quite so adventurous in the pants and skirt department, why not just select your comfort-zone work clothes in a paler color palette? The simple act of wearing clothes in shades that don't absorb the hot sun will keep you phyisically cooler when you venture out, and mentally in summer mode, even if you're indoors most of the day. A cream or khaki-hued skirt will always look sharp no matter what shade you pair it with on top, or try white on cream or pastel for a more modern look. Need help finding the perfect summer wardrobe for your professional life? Contact me to find the styling service that's right for you.